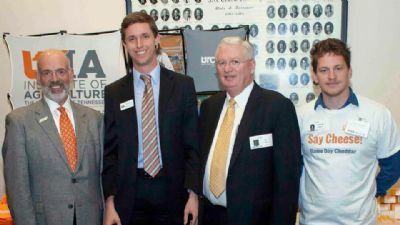 The Legislative Plaza at Tennessee’s capitol was all abuzz last month during the annual UT Day on the Hill, a chance for the UT campuses and institutes to showcase their achievements. It was particularly busy at the UTIA booth, where legislators and visitors got a taste of a new project initiated by AgResearch. 'All Vol Cheese' is the first product produced through AgInnovations, a new public-private entrepreneurial program. Working with the AgInnovations staff, faculty, researchers, and students have the opportunity to turn their ideas into a business. Thomas Frederick, a master’s student with the Department of Food Science and Technology, was on hand to provide samples of the four flavors of cheese—Checkerboard Mild Cheddar, Game Day Sharp Cheddar, Smokey’s Smoked Gouda, and Torchbearer Jalapeño. Visitors had a chance to choose their favorites and receive information on how to purchase the cheese. Even UT President Joe DiPietro stopped by to sample. AgInnovations and the students worked with Sweetwater Valley Farm to produce the cheese. The product is made at the company site in Loudon County, and the students learned about the process of cheesemaking. In addition, they also gained insight into manufacturing and regulatory issues. Frederick was able to share this experience with legislators who were very interested in the project. To purchase All Vol Cheese, visit tiny.utk.edu/cheese.